The Bush administration's plans to convene a new round of Israeli-Arab diplomacy on Nov. 26 will, I predict, do substantial damage to American and Israeli interests. As a rule, successful negotiations require a common aim; in management-labor talks, for example, both sides want to get back to work. When a shared premise is lacking, not only do negotiations usually fail, but they usually do more harm than good. Such is the case in the forthcoming Annapolis, Maryland, talks. 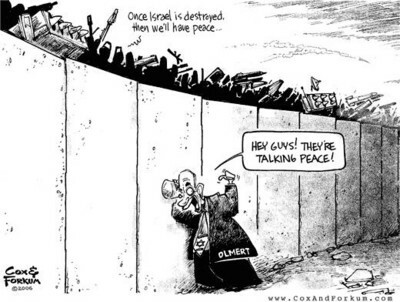 One side (Israel) seeks peaceful coexistence while the other (the Arabs) seeks to eliminate its negotiating partner, as evidenced by its violent actions, its voting patterns, replies to polls, political rhetoric, media messages, school textbooks, mosque sermons, wall graffiti, and much else. Damage will be done should the Israeli government make "painful concessions" and get a cold peace or empty promises in return, as has consistently been the case since 1979. This lop-sided outcome would, once again, boost Arab exhilaration and determination to eliminate the Jewish state. 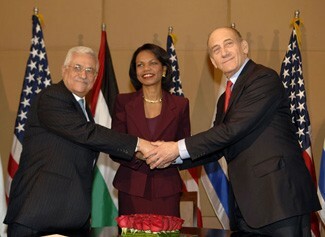 Mahmoud Abbas, Condoleezza Rice, and Ehud Olmert: Will they be celebrating at Annapolis? Contrarily, should the Israelis resist a joint U.S.-Palestinian position, I see a possible crisis in U.S.-Israel relations of unprecedented proportions – worse than 1975 or even 1957. That's because, in part, the stakes are so high. Secretary of State Condoleezza Rice has stated that "the United States sees the establishment of a Palestinian state, a two-state solution, as absolutely essential to the future of not just Palestinians and Israelis but also to the Middle East and, indeed, to American interests." If a Palestinian state is "absolutely essential … to American interests," whoever stands in its way will presumably pay a heavy price. As I have been arguing since November 2004, U.S.-Israel relations are hanging by a thread. Annapolis renders them yet more vulnerable to disruption. Putting aside these deep and inescapable problems, the talks face two practical challenges: On the Palestinian side, "Fatah figurehead Mahmoud Abbas" (as Jerusalem Post columnist Caroline Glick calls him) is an extremely weak reed. "There is no responsible Palestinian leadership that could deliver a newspaper on time in the morning," the Jerusalem Report's Hirsh Goodman notes, "much less a peace agreement that would stand the test of time." On the Israeli side, Ehud Olmert's prime ministry could crash if his skittish partners abandon the ruling coalition. Shas and Yisrael Beiteinu have warned against dividing Jerusalem and other steps. Ehud Barak, head of the Labor Party, reportedly will reject any plan denying freedom of movement to the Israel Defense Forces in the West Bank. Foreign Minister Tzipi Livni could bolt if a Palestinian "right of return" is not renounced. That a recent poll finds 77 percent of Israelis think their government is "too weak to sign a peace agreement with the Palestinians in Israel's name" increases the chance of defections. These grim prospects raise the question: Why, after nearly seven years of staying aloof from Israeli-Palestinian negotiations, has the Bush administration now succumbed to the bug? Some possible factors. Iranian threat: Rice sees an opportunity for U.S. diplomacy in a Middle East re-alignment resulting from Iranian aggression, both actual (Hizbullah, Hamas) and future (nuclear weapons). Inaction worse: If nothing is done, Kadima's already dismal standing in the polls will continue to fall and Fatah's tenuous hold over the West Bank will erode. The prospect of Likud and Hamas succeeding Olmert and Abbas pleases the Bush administration no more than it does those two men. Legacy: Zbigniew Brzezinski has articulated the foreign policy establishment's hopes for Annapolis and its dim view of Rice: "She realizes that her legacy right now is really very poor. If she can pull this off, she will be seen as a real historical figure." Civil rights: Rice believes in a bizarre analogy between West Bank Palestinians and southern Blacks. Messianism: Both George W. Bush and Rice seem to view themselves as destined to resolve Arab-Israeli hostilities. One interlocutor recounts that "she believes this is the time for the Israeli and Palestinian conflict to end." Rice's comment echoes both George H.W. Bush's 1991 statement that "the time has come to put an end to Arab-Israeli conflict" and Israeli prime minister Ariel Sharon's 2005 announcement of his intent "to resolve this problem once and for all." But, as Irving Kristol has memorably observed, "Whom the gods would destroy they first tempt to resolve the Arab-Israeli conflict." Cox & Forkum in 2006 skewer Israeli desperation for "peace"
Nov. 26, 2007 update: I cannot resist quoting Youssef Ibrahim, "Owls Gather at Annapolis. Clearly what will happen at Annapolis is that Mr. Bush, the man who promised modernity and democracy for the Middle East, will inaugurate it with a speech that will be quickly forgotten, then leave the grounds for the rest of the world to grumble over the next year about yet another American Middle East failure. Related Topics: Arab-Israel conflict & diplomacy, Israel & Zionism, US policy | Daniel Pipes receive the latest by email: subscribe to the free mef mailing list This text may be reposted or forwarded so long as it is presented as an integral whole with complete and accurate information provided about its author, date, place of publication, and original URL.